with larger size swim baits. prevents the fish from leveraging itself off when hooked. when rigging up an entirely new Umbrella Rig can take up much needed time. achieve the ultimate in flash and vibration. 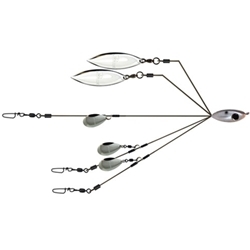 triples that this rig commonly catches. Overall Length 9” Wire Length 7.5"